I am working on reducing my stash and since I have a lot of leftover acrylic baby yarn (small amounts left from making bigger projects like blankets and baby dresses), I decided to make a bunch of newborn hats to donate. 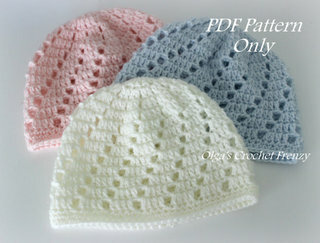 I have made tons of baby hats before, but this is yet another new pattern. I like the ribbed texture it has. 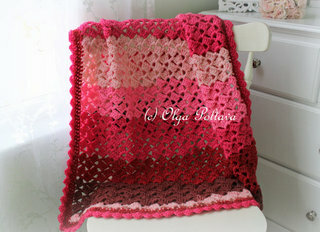 It can be made in one color, or a multitude of colors. 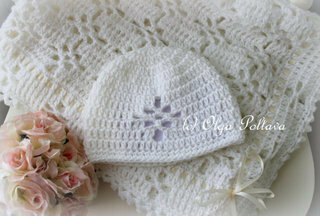 I've made half a dozen hats so far. But there is still so much yarn left. 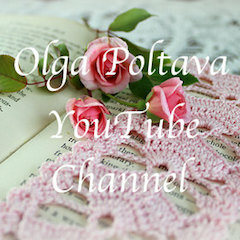 I will be making more! 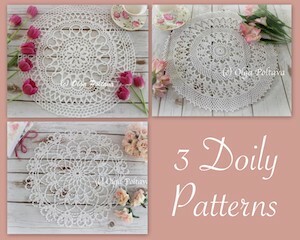 Very easy doily pattern. And yet, I managed to make a mistake! I noticed it just now, looking at the photo. 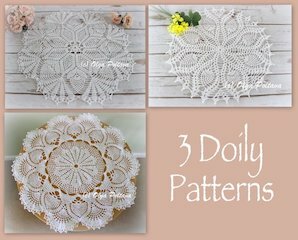 I don't think I would've noticed it from the doily itself. 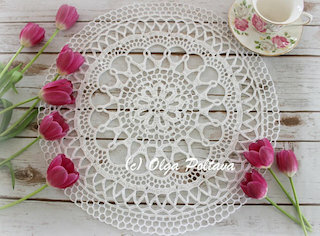 There are only eleven rounds, and it took me about forty minutes to make the doily this morning. I used size ten cotton thread and a 1.25 mm steel hook. 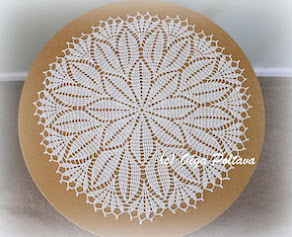 My doily came out ten inches in diameter. Rnd 1: Ch 7, sl st in first st to form a ring. Ch 1, 12 sc in ring. Rnd 2: Ch 5 (for a dc and ch 2), dc in next st, * ch 2, dc in next st, repeat from * around, join last ch 2 to third st of first ch 5. Rnd 3: Ch 7 (for a dc and ch 4), dc in dc, * ch 4, dc in next dc, repeat from * around, joining last ch 4 to third st of first ch 7. Rnd 4: Ch 9 (for a dc and ch 6), dc in dc, ch 6, dc in next dc, repeat from * around, joining last ch 6 to third st of first ch 9. Rnd 5: Ch 16 (for a dc and ch 13), dc in dc, * ch 13, dc in next dc, repeat from * around, and join last ch 13 to third st of first ch 16. End 6: Sl st in each of first 2 sts, ch 3 (for first dc), dc in each of next 3 sts, * ch 7, dc in each of next 4 sts of same lp, ch 3, sk 2 sts of next lp, dc in each of next 4 sts, repeat from * around, end with a ch 2 and hdc in top of first ch 3 made. This brings thread in position to begin next rnd. Rnd 7: Ch 5, * (4 dc, ch 7, 4 dc) in lp between dc groups below, ch 2, dc over ch 3 below, ch 2, repeat from * around, end with a ch 2, sl st in third ch of eh 5 first made. Note: Thread over hook 4 times for a tr tr in next round. Rnd 8: Ch 9, * 5 dc over ch 7 lp, ch 3, (tr tr, ch 9, tr tr) in dc, ch 3, repeat from * around, end with a ch 3, tr tr at base of ch 9 first made, ch 9, sl st in 6th ch of ch 9 first made. Rnd 9: Sl st in each of 3 sts and first dc of 5 dc group, * sc in each of next 3 dc, ch 4, dc in sccond st of ch 9 below, (ch 1, dc in next st) 6 times, ch 4, sk first dc, repeat from * around, end with a ch 4, sl st in first sc made. Rnd 10: Sl st to middle of next sc, ch 4, * dc over ch 1 sp between dcs, (ch 5, dc over next sp) 5 times, ch 4, sc in middle sc of 3 sc group, ch 4, repeat from * around, join at beginning. Rnd 11: Sl st to center of lp between 2 dcs, ch 11 (for a dc and a ch 8), * dc in each ch 5 sp with ch 8 between, ch 2 between each scallop, repeat from * around, join and fasten off. Block and shape. I had wanted a crochet lace dress for a long time. 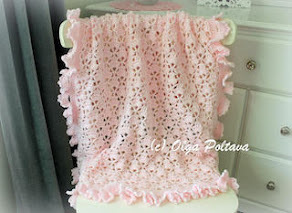 Some day, I thought, I will make myself a gorgeous dress! Then last month, I was browsing Etsy and came across a beautiful pink dress; I instantly fell in love with it. I bought it the same day, and here it is! This dress was designed and made by Marina Tsareva, who lives in Ukraine. The dress is made of mercerized organic cotton. It is a pricey dress, but I thought it's okay to splurge on myself once in a while. Besides, knowing that my money went to a talented and hardworking woman in Ukraine (which is my native country, so I know firsthand how hard life is there) actually makes me feel good and happy! 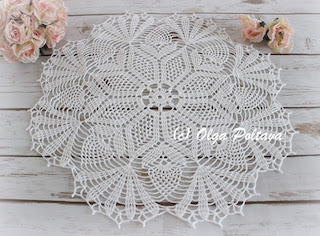 Please, visit Marina's Etsy Shop simply to admire her work and perhaps give her beautiful creations a like or two, so that more people can learn about her amazing work. But be warned that just like me, you might see something you won't be able to walk away from. 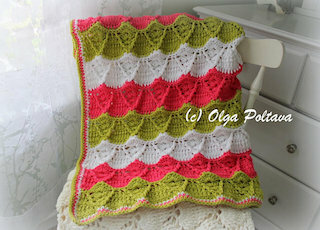 As for me, I cannot wait for spring, so I can wear my lovely dress. My doll Lucy got a new dress. Isn't she a lucky girl? I made this dress with one skein of Baby Bee Delight Yarn (60% acrylic, 40% polyamide) and a size F (3.75 mm) hook. 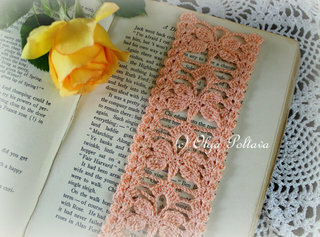 I had just a tiny bit of the yarn left, just enough to make a simple headband. This doll is so beautiful. I bought her a few years ago from a consignment doll shop. She is a Marie Osmond baby Ashley doll, but I named her Lucy. Isn't she adorable? She even has a cute dimple on her chin. The pattern for Lucy's dress in available in my Etsy shop. I recently reorganized my craft supplies, and I realized I have lots of crochet acrylic thread. Something must be made with it! 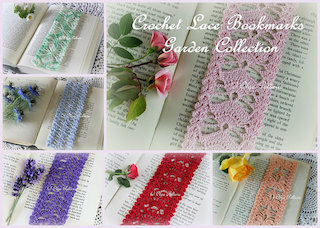 The thread is perfect for summer crochet items. This is the first one I made. It's a simple pineapples and shells summer top. I found the symbol chart on Pinterest (see it here). 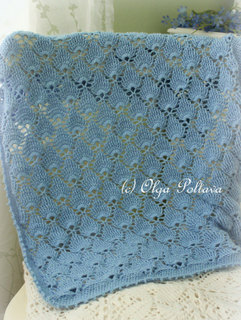 I worked with a size D/3 (3.25 mm) hook, and the work went along quite fast. I did have to frog it a few times as I realized I made a mistake a few rounds back. You know how sometimes you just crochet absent-mindedly? That was the case with me. 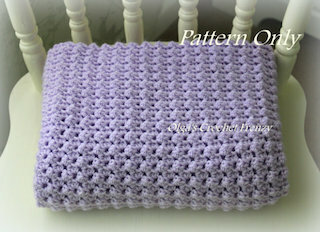 I am pretty comfortable with both written patterns and graphs, so I didn't have any trouble with this pattern. When working with a graph pattern, you don't have a given gauge, so I had to adjust the pattern a bit to make it my size. The only problem with this graph is that you need a very good eyesight. It's especially difficult to see right in the beginning (the middle) of the chart. Ch 6, join in ring with sl st. Round 1: ch 3 (counts as 1st dc), 15 dc in ring, join with sl st to 3rd ch of beginning ch-3. Round 2: ch 3 (counts as 1st dc), dc in same space as joining, 2 dc in each dc around; join. Round 3: ch 3, dc in same space as joining, ch 2, 2 dc in next 2 dc, ch 3, skip next 2 dc, *2 dc in next 2 dc, ch 2, skip next 2 dc, 2 dc in next dc, ch 3, skip next 2 dc* three times, 2 dc in next dc, join. Round 4: sl st in next ch-2 space, ch 3, (dc, ch 2, 2 dc) all in same ch-space, ch 1, 10 dc in next ch-3 space, ch 1, *(2 dc, ch 2, 2 dc) all in next ch-2 space, ch 1, 10 dc in next ch-3 space, ch 1* three times, join.